JOHN GASPARD’S Character, Eli Marks!! 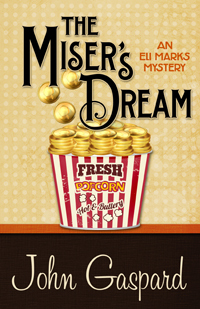 INTRODUCING….Character Eli Marks, THE MISER’S DREAM, An Eli Marks Mystery by JOHN GASPARD. My name is Eli Marks, but my uncle (magician Harry Marks) has always called me “Buster” ever since I was a kid. His reasoning is a bit byzantine: The magician Harry Houdini was friends with another vaudeville couple, the Keatons. One day Houdini was there when their very young son (his godchild) tumbled down some stairs. Houdini (allegedly) picked him and said something along the lines of, “My, that was quite a buster.” The name stuck and we now know that kid as legendary comedian Buster Keaton. Since I’m Uncle Harry’s godchild … and he’s a magician named Harry … to him it made perfect sense to call me Buster. And he still does it to this day. Born and raised in Minneapolis, although I did live for a couple years in St. Paul, but that was short-lived and ill-advised. That may have been because I was living with my ex-wife then (although at the time she was not yet my ex). So I don’t entirely blame St. Paul for the experience, but I believe the city was, at least to some degree, at fault. As a kid, my Uncle would often take me on trips to Los Angeles, where I got to see shows at the Magic Castle. On one such trip, I demonstrated a card move to one of the older magicians, not realizing I was talking with a true legend: Dai Vernon, the magician who fooled Houdini. Even though I was a kid, Dai didn’t treat me that way and gave me some very good (and painfully honest) advice about what I was doing wrong and what I needed to do to get better. His opening response (“That was terrible!”) stuck with me and although it may seem like a harsh reaction, I really appreciated that he treated me like a pro and expected me to act like one. Since then, when kids come up and ask for advice, I always deal with them as if we’re peers. I’m not as caustic as Dai Vernon (few people are), but I’m just as direct and straightforward. Typically, a night out for me means I’ll going to a cocktail party … dressed to the nines (or tens) … where I’ll be surrounded by rich, attractive people who love me (for the five minutes I spend doing tricks at their table). Then it’s on to the next group with my little bag of magic tricks and mildly amusing comic patter. Hardly ever get angry anymore (frustrated, sure, but not out-and-out angry), but as a teenager (living with a charming uncle and a loving but firm aunt), I would escape to the movie theater next door when my emotions got the best of me. I spent a lot of time in that theater, so I must have been angrier than I remember. Now my visits to the theater are much less emotionally-charged — except for recently, when I discovered a dead body in the theater. But that hardly ever happens. Fell for my landlady, a newbie psychic named Megan. We’re both recently divorced and met while in the whirlwind of a murder investigation. Wiser heads prevailed and she asked to take a break, which went on for, I don’t know, forever. Or about three months. We’re back together now but I don’t feel entirely on firm footing, particularly since the arrival of a handsome and way-too-charming magician named Quinton Moon who seems to have set his sights on Megan. He’s like a better, smarter, more talented version of me. See my thoughts about Quinton Moon above. I’d make us reservations at a nice restaurant. The current outfit is pretty typical, except it normally includes pants. I’m tempted to say “pants,” but in reality they’re right over there. Be sure to come back to read more about John, Eli, and THE MISER’S DREAM, an Eli Marks Mystery, on Wednesday’s Karen’s Killer Book Bench. Happy Reading!